Parkland Cross Country Ski Club | Page 2 of 19 | Our Mission is: To enjoy, enhance, facilitate and promote cross country skiing. On March 12-13, 2016 four intrepid women (Judy, Dianne, Assistant Linda and Leader Marilyn) set off in search of Paradise—Valley that is. Warm weather had us doubting if we could find snow but we forged ahead never-the-less. We arrived at Castle Mountain hostel in good time and were greeted by an incredible ruckus made by 16 women aged (like a fine wine and rather full of it by then) in their 40’s to 60’s. They apparently were former girl guides who get together annually at Castle Mountain to revive their camp days of singing around the campfire. And sing and dance they did with abandon. Made me wish I’d been a girl guide too all those years ago. They obviously had also earned their cooking badges given the feasts they took turns preparing for all. Beware, they have already booked the hostel the same weekend next year. This entry was posted in Trip Reports on 2016/04/15 by parkland. 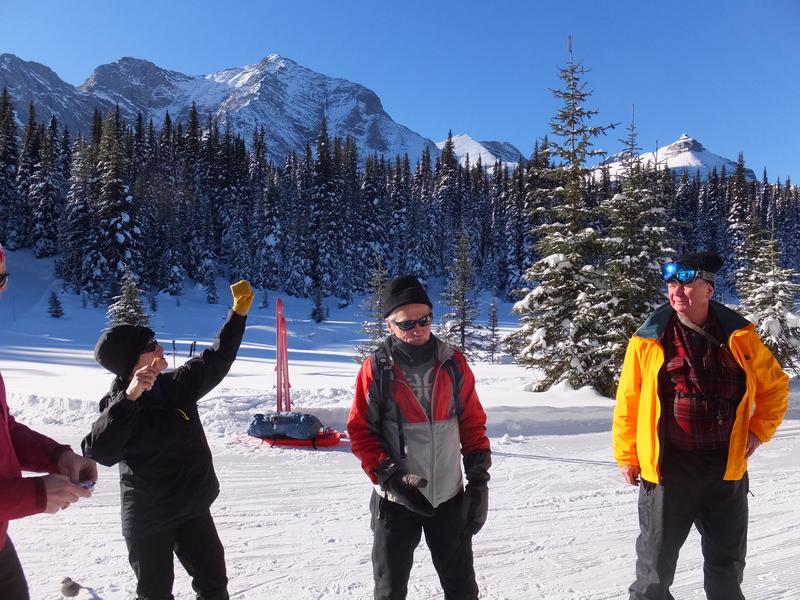 We arrived at the Ribbon Creek hostel at 9am on January 23rd, 2016 to meet up with the rest of the Parkland Ski Club. As we live in Cochrane, it was only a 50 minute drive for us. So we decided not spend the nights at the hostel. The temperature was a pleasant – 5 Celsius, with no wind. 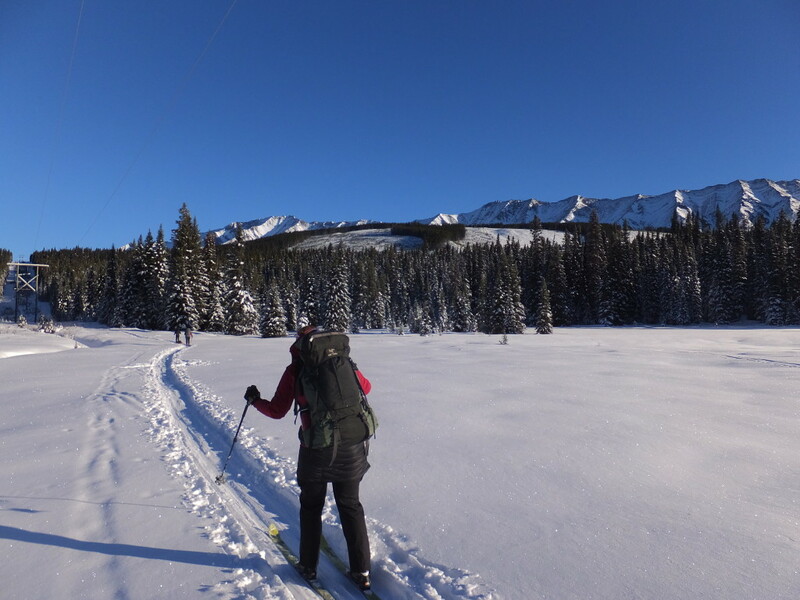 There was three centimeters of new snow from the previous night, so near perfect trail conditions.After introductions and breakfast clean-up, we packed up from the hostel and arrived at the Elk Pass parking lot at 10:15am. 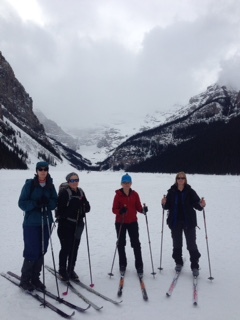 There, we set out on the trail with the group after waxing up our skis. It was a blue wax day, which worked for the entire day. The initial climb from the parking lot was challenging, as this is the first time I have been out on skiis in the past 2 years. But after a number of breaks, we arrived at the summit of Blueberry Hill around 1:00pm. 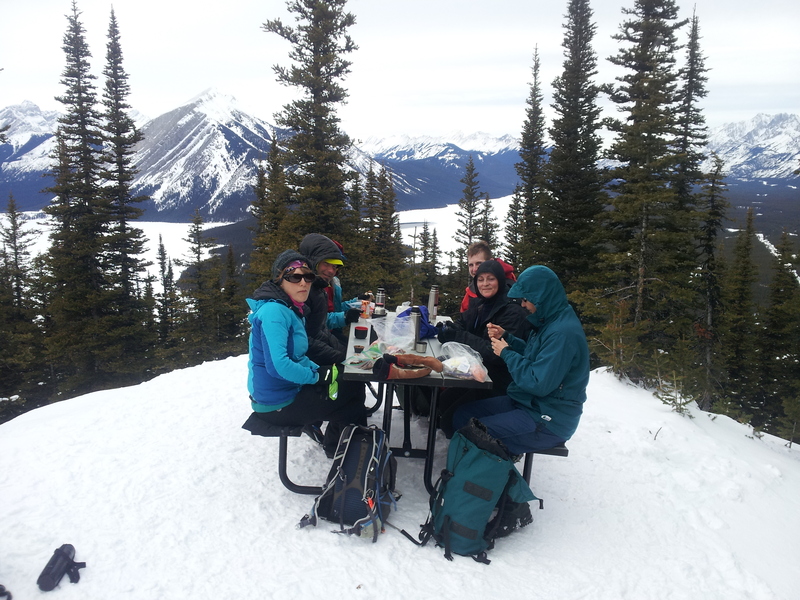 Once at the top, we took a lunch break with the group. The views of the Upper and Lower Kananaskis Lakes and surrounding mountains where spectacular. Everyone enjoyed the surroundings and I’m sure the Whiskey Jacks enjoyed our company also. There was a group of Japanese skiers ahead of us, and we kept crossing paths on the trails during the day. When coming down from the Hydro Line, some of the Japanese skiers elected to take off their skis and walk down the steep hill. This made it challenging to follow them down, as they walked down the middle of the hill, and did not keep to the side. Lisa came down the hill with lightning speed, after maneuvering around some of those Japanese skiers. Luckily, once at the bottom of the hill, Ivan taught them the proper way to descend down the hill, so that they do not become hazards to other skiers coming down the hill. We decided to take the Fox Creek Trail back to the parking lot, and it presented new challenges during the day. 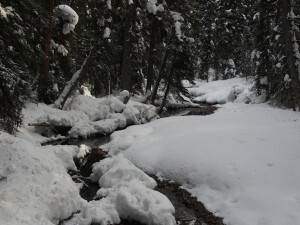 While on the trail, we found that the snow was hard packed and icy. We had to ski with caution through this area, as to avoid the hazards of trees and slipping. Once we got back to the parking lot, we added up the distance we traveled. We skied 18.5 km for the day and it was good to get back to the car and back to the hostel. Being the first time I was on skis in 2 years, it was a great day and workout. On the way back to the hostel, we stopped at the Kananaskis Visitors’ Center for a quick visit, as Marilyn wanted to pick up some maps and brochures of the area, for future reference. Back at the hostel, we were all treated to Ivan’s “Blueberry tea”, followed by appetizers and good conversation by the fireplace. This was also the first time, in about 15 years, that I was able to enjoy a fondue meal. 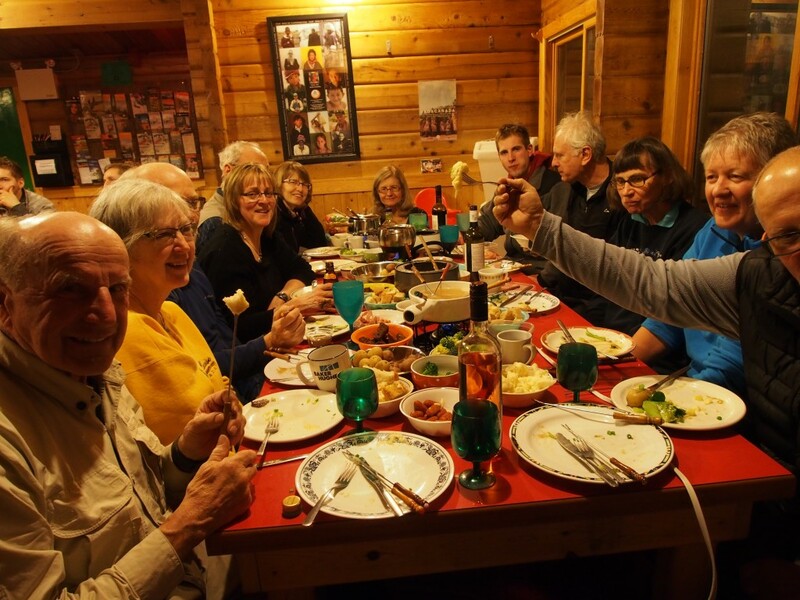 The whole group and I (approximately 14 people) sat at the table to enjoy cheese and chicken broth fondues, cauliflower, broccoli, potatoes, and bread. This was then followed by dessert fondues of chocolate and bumble berry. Shortly after the meal and washing dishes, my father and I said goodnight to the group around 10:30pm, and drove back home to Cochrane. 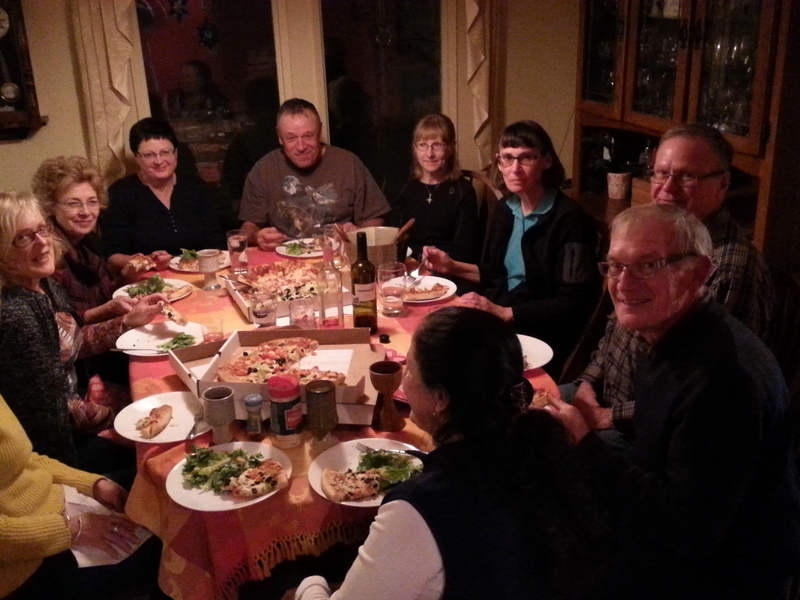 I was very impressed with the camaraderie of everyone and how they all contributed to both the meal and the dishwashing. You have a great group of people and a great community in the club. 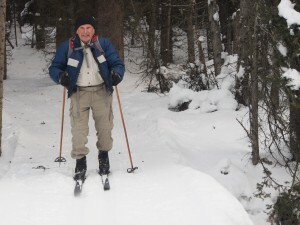 I would like to thank Marilyn for organizing this trip and Ivan for taking time to teach me new skills and techniques in back country skiing. This entry was posted in Trip Reports on 2016/02/09 by parkland. 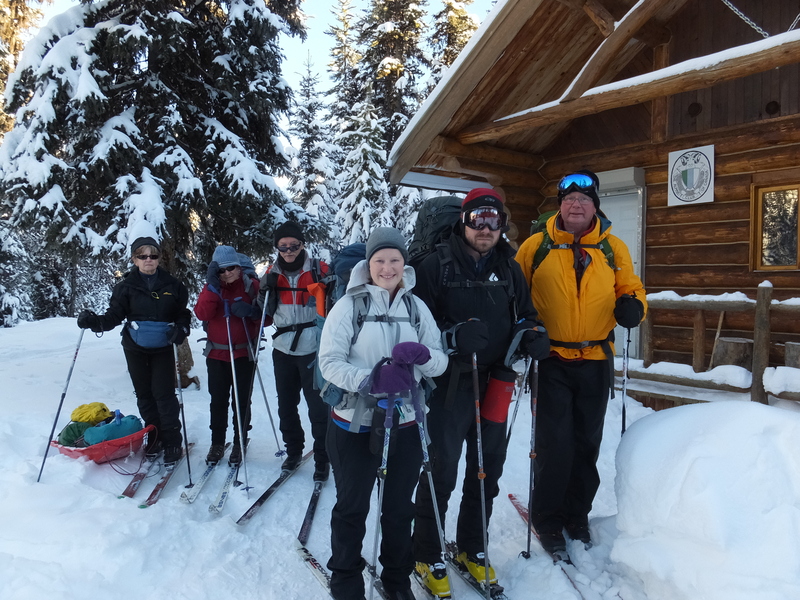 The Elk Lake Hut Backpack Trip, Saturday/Sunday 28th 29th Nov. 2015. Thanks Tudor for the trip report. Sunny skies and great skiing weather, compared to last year’s -30 and cancelled. The set tracks and snow conditions very good. Depth of snow 40 cm on our downhill to hut. Temp: -19 at start at trail head parking, to plus in afternoon sun. We were eight: Kelly, Linda, Judy, Barb, Amanda, Bob, Dion and Tudor; and Saturday sleepover with four others in the hut. on a rough tracked carousel. three tries for a Welshman! to the knee deep base. Fall after fall, takes my stuffing. Many a but, but not beaten. …and stable tracked sprint to finishing post. Next year, skins for sure. Many thanks to Kelly and Linda our trip leaders, and all for your preparation, company, advice, fun. This entry was posted in Trip Reports on 2015/12/11 by parkland. 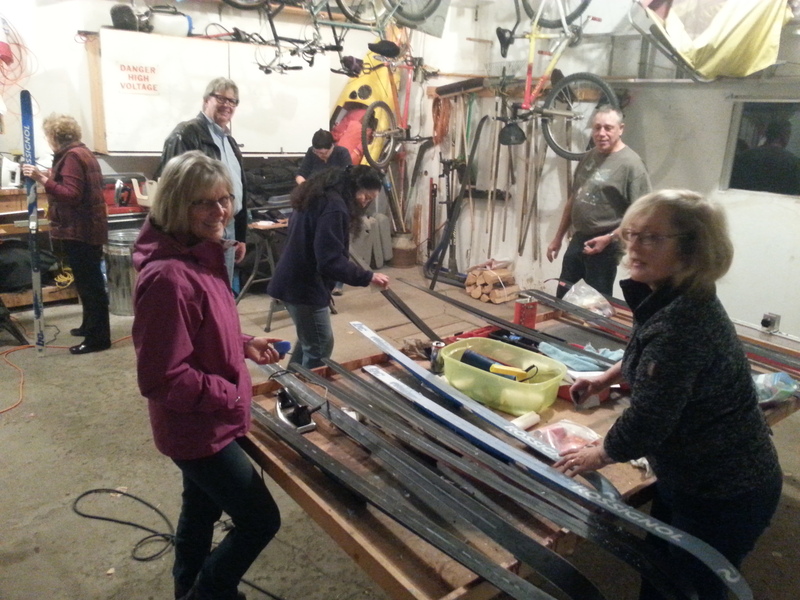 This entry was posted in Trip Reports on 2015/12/03 by parkland. First Day Tour of the Season! Intrepid adventurers wading through trampled grass! 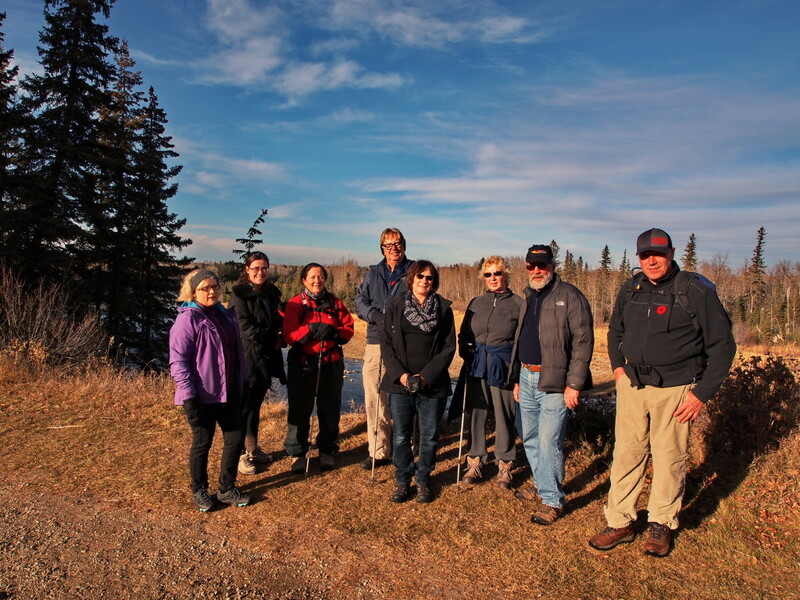 This entry was posted in Trip Reports on 2015/11/30 by parkland.